Amedee Gordini established himself as a racing car manufacturer in 1946 and was nicknamed "Le Sorcier" (The Sorcerer) because of his ability to extract maximum performance from a small car with unpromising appearance and small engine. He had been tuning cars and competing in motor races since the 1930s, and his results were so impressive that Simca (the French assembler of Fiats) hired him for its motor sport programme and to develop road cars. Their association continued after WWII. In 1946, he introduced the first cars named after him, which were Fiat engined single seaters raced by him and Jose Scaron, and achieving several victories. In the late 1940s the company opened a workshop at the Boulevard Victor in Paris, entering into GP races. Gordini and Simca started to diverge in 1951 because of political differences. 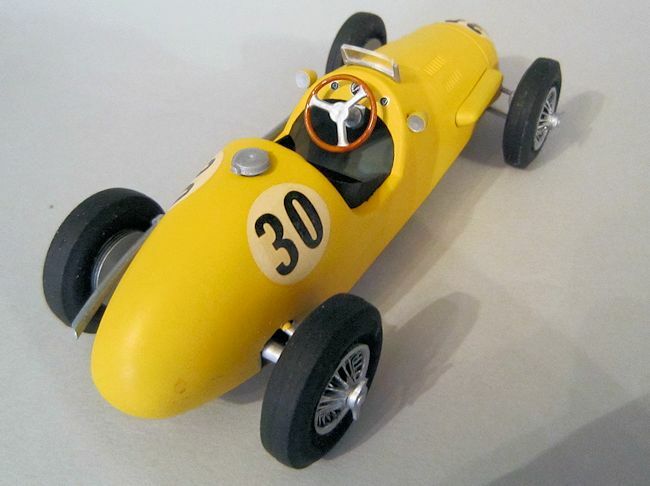 Gordini competed in Formula One from 1950 to 1956 (with a brief return in 1957), although it achieved major success in Formula Two during that period. 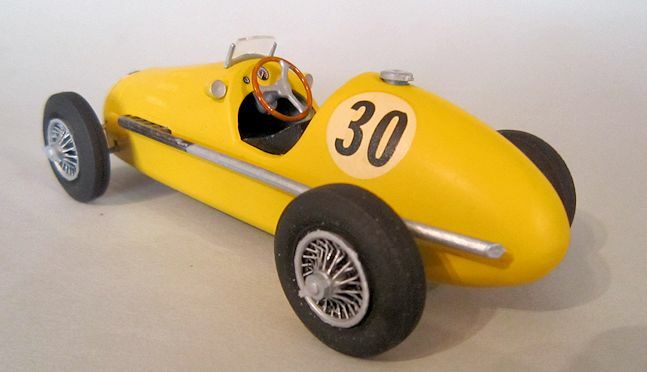 In early 1952, Gordini fashioned a new car, the T16. Its small size and weight would make the car quite nimble, but unlike many chassis of the time, the T16 was vertical in design. Other teams made cars that widened out at the front, lowering the centre of gravity. While nimble, the T16's was narrow and had a higher centre of gravity which left the car somewhat unstable. The nose was blunt although the grille opening was often widened or removed for extra cooling. It had an arch shaped body with louvered hood, over a new 2 litre, straight six engine. It was claimed to produce 175 bhp, but it proved throughout the season that that was somewhat exaggerated. The chassis was a ladder-type tubular structure, with torsion bar suspension at the front and the rear. The tiny cockpit was sparse, with only a couple of instruments on the panel. A large steering wheel dominated the cockpit, with an aero-screen for protection, flanked by two small mirrors. Though small, the cockpit was very exposed with cut out sides, which left many drivers feeling they might leave the car at tight corners or bumps. Drivers had to press their foot against the firewall, and their backs against the seat, in order to remain ensconced. There were no seat belts in those days, nor roll over bars. The rear axle proved troublesome and often ended the race prematurely in the 1952 season. Braking was by four-wheel drum brakes. However the overall design made the car neat and clean, with front and rear suspension hidden by the bodywork, with only the arms protruding out of the sides. Though underpowered, it was compact and agile and would give Ferrari's 500 a run for their money throughout the Formula One World Championship season. The car proved too fragile to be a consistent winner, but it still holds a place in the heart of French racing car enthusiasts. As usual with Merit kits, the division between upper and lower body runs right along the centre line of the side of the body, just where it is most visible. Because of this I put the front and rear suspensions in place then closed the bodywork with a lot of glue and left it overnight to set. The centre line seam can now be attacked with the crudest sanding stick you have, together with frequent applications of filler where necessary. This is the major part of construction, and care taken here will yield results. Use finer and finer grades of sand paper, until the scar vanishes. If you don't make good that central seam, the end result will look awful. The kit is moulded in French Racing blue, no doubt to make it easier for the younger modeller. Once satisfied that the seam could longer be seen, I decided to paint the body the Belgian team colour yellow, just for something a little different. Chassis 32 of the Ecurie Belge raced in 1956 with various drivers at the helm including the famous Jean Behra. Yellow is always a swine of a colour to use. I gave the whole car an undercoat of Tamiya's excellent Primer White from a rattle can, but I believe it is better to use a light shade of pink or even mauve if you can beneath yellow. After a couple of coats from a Humbrol rattle can of yellow, allow to cure for a day or two, and then continue with the details. The axles and brake drums can be picked out in flat aluminium for which I used Hannants RLM 01 Silber, which brushes well, without leaving brush marks. The nose grille was masked off and sprayed silver from a Humbrol rattle can number11. And then the gaps in the grille and the linings of the brake drums were highlighted using black Indian ink. Apply a small amount with a brush, and the ink will be drawn along the trench by capillary action. Merit cars always have the nose grille moulded solid. In the past I have had some success where it is meant to be a mesh. I used a motor tool to remove the grille and then made a mesh one using on one occasion old tea strainer, and for their Lancia-Ferrari, some old brass mesh I found in the road near a garage. This wasn't an option for the Gordini, as the grille is composed of broad slats. I started to remove them from the inside with a drill,but found the plastic melting rather than being ground away. So I didn't risk it. The result is not entirely satisfactory, but better than doing nothing. The ribbing on the brake drums on the other hand look a treat. The model was sold without decals, and so I found three dials from some old sheet in the spares box and added them to the dash. Since the body is already in finished, the seat can be inserted after painting it semi matt black, and giving it a rub with a finger to simulate a leather patina. The steering column holder has to be edged beneath the dash, and allowed to set, before the wheel can be inserted. Here again, the wheel column needed to be thinned to fit. Spokes were painted silver and the rim medium brown with a coat of clear orange. The one piece exhaust was finished in steel and a couple of grimy washes to the front end. Photos show that the staining ends quite abruptly just ahead of the cockpit. A touch of petrol blue gives it a nice sheen, although it doesn't show up in the pictures. The wheels in the kit are the usual Merit abomination. They were always the one thing that let their cars down. When Smer re-boxed a couple of them, the Talbot Lago and the Alfa Romeo, they gave them new plastic spoked wheels, but they too are becoming rare and not worth cannibalising. As luck would have it I had some old E-Type wheels from a Jag which had long since departed the purgatory of the shelf of doom, and was now safely in Jaguar heaven. They are the wrong pattern being too conical in shape, but they area lot better than the kit's. The rims and the backing plate needed to be sanded down to fit the kit's tires. And the stub axles need to be cut off the brake drums. After that they were glued in place. The tires do in fact have a very slightly raised moulding of the tire manufacturer's name. I think I can just make out the name Englebert. I tried picking them out in matt white but they weren't raised enough and the result was a dog's dinner, so they went back to black. 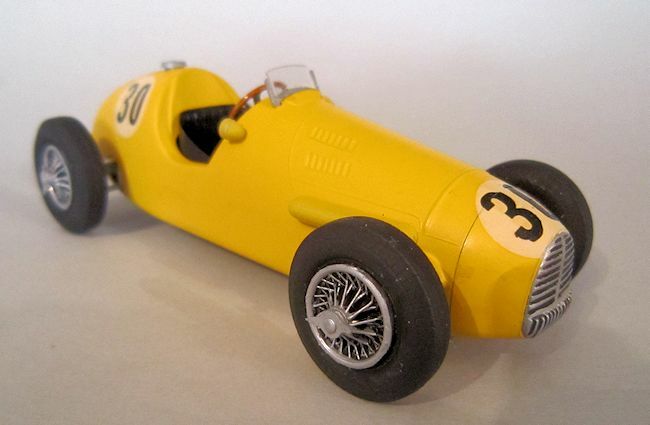 The decals came from the spares box again, and are correct for the Chassis number 32 car, which raced for Team Belgium in the 1950s, with various drivers including Pilette, Claes and Behra. Half a gallon of microset was needed for the front end white circle to settle over a complex compound curve. And it was cut to fit around the grille when still soggy. A risky business, but I could see no other way. After that it is the small details. The stalks of the wing mirrors will need diminishing in diameter to fit. The petrol filler is flat aluminium, the windscreen surround in the same, and finally the windscreen is secured with clearfix. Looking at the photos, I realise that what I must now do is drill out the end of the exhaust and add a little black smoke. Since I didn't glue it in pace, it won't take long. 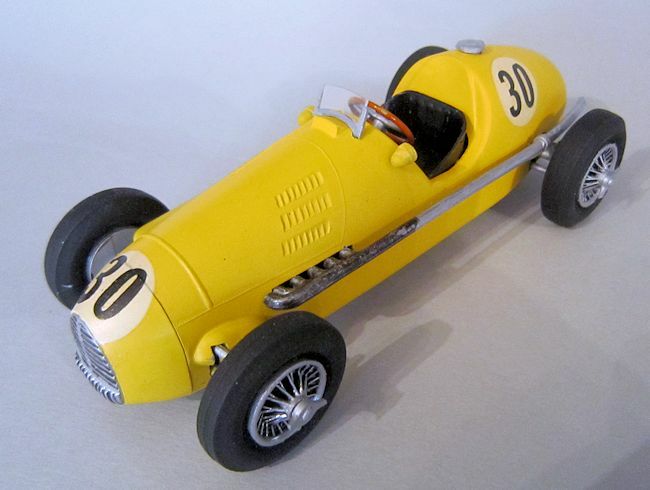 And there you have it, one presentable model of a nimble 1950s racer. It would be possible to superdetail the kit very easily if you wished. The bonnet would need to be sawn open. And then an engine and chassis scratch built, but there are plenty of photos on the internet for all of that. And the cockpit could do with a gearbox and some chassis detail. I made it because wanted a break from aircraft and because it is so rare to find a good kit in this scale of any GP car from the 1950s. Like aviation of the golden age of the 1920s and 30s, it is ignored by mainstream manufacturers who seem to think that Grand Prix racing began in the early 1970s, and didn't really get going until 1980.